David Alan Coulier (born September 21, 1959) is an American stand-up comedian, actor, voice actor, impressionist and television host. He is well known for playing Joey Gladstone on the ABC sitcom Full House and for voicing Peter Venkman on the cartoon adaptation of Ghostbusters and the infant incarnations of Animal and Bunsen on Muppet Babies. St. Clair Shores, Michigan, U.S.
David Alan Coulier, formerly Couwlier, was born to David Alan Couwlier and Arlen Couwlier in St. Clair Shores, Michigan, on September 21, 1959. His mother's side of the family is from Bathurst, New Brunswick, Canada, and his paternal grandmother was a Jewish immigrant from Germany. He got his start in stand-up comedy in high school by impersonating his principal and other staff over his high school's PA system. He graduated in 1977 from Notre Dame High School in Harper Woods, Michigan, where he was a member of the varsity ice hockey team, playing defense alongside future NHL player John Blum. Coulier also attended high school with Mark Cendrowski whose claim to fame is directing The Big Bang Theory. Coulier and Cendrowski have been friends since the third grade and were always making 8mm films together during high school. Coulier also attended The University of Michigan but dropped out after his freshman year to pursue comedy full time. Coulier met future Full House co-star Bob Saget through the Los Angeles comedy circuit. The two became good friends and Coulier briefly lived with Saget and his then-wife Sherri on their couch in the early 1980s as he struggled to get his career started. He was initially cast as a player for Saturday Night Live for the 1986 season. However, right before the season started, casting changes were made and he was left off the show. It was said that many of the producers felt he was too similar in humor style to Dana Carvey, who was also joining the show in 1986, and that was why the change was made. Coulier has done extensive voice work for shows including Scooby and Scrappy-Doo, The Real Ghostbusters, Slimer! and the Real Ghostbusters (taking over the character of Peter Venkman after Lorenzo Music's departure from the role), Extreme Ghostbusters, Muppet Babies after Howie Mandel left (Baby Animal, Baby Bunsen, Bean Bunny, and Uncle Statler and Waldorf, and a pre-teen Janice for one episode), The Jetsons, Rude Dog and the Dweebs, and Detention. From 1984 to 1985, he was also the host of a comedy series on Nickelodeon known as Out of Control. Coulier is known for playing Joey Gladstone on the ABC sitcom Full House. He stayed on the show from 1987 until its cancellation in 1995. He was famous for doing voices and impersonations. In addition to Full House, Coulier appeared on George and Leo and Nick Freno: Licensed Teacher. He has also hosted America's Funniest People (first with Arleen Sorkin and later with Tawny Kitaen) and Opportunity Knocks. Additionally, he was also a voice actor in Yogi Bear and the Magical Flight of the Spruce Goose and has voiced Felix the Cat on a few occasions. He also put out a solo album called Cut It Out, a self-proclaimed tribute to "tank tops and short shorts." In addition to his voice work, Coulier has also taken a few acting parts appearing in the Disney Channel Original Movie's The Thirteenth Year and The Even Stevens Movie (where he had a cameo as a reality show host), as well as the Nickelodeon original movie Shredderman Rules and he wrote and starred in an unaired pilot for FX called Whispers and Balls. He also founded his own children's entertainment company F3 Entertainment, in 2000. In 2003, Coulier appeared on season three of The Surreal Life. In 2006, he appeared on the TV reality show Skating with Celebrities on FOX, where he was paired with Olympic medalist Nancy Kerrigan. They were eliminated in episode four. Currently, he is a member of Duck's Breath Mystery Theater touring comedy troupe (which he claims is clean comedy but "not quite as creepy" as Full House) as well as host of the series Animal Kidding. His work on Robot Chicken is probably his most "adult" to date, voicing off-color situations, like Popeye savagely beating Wimpy over a debt. On June 2, 2008, Chikara, professional wrestling promotion based in Philadelphia, Pennsylvania, announced that Coulier was elected by the Chikara Board of Directors as the new commissioner of the company, a position that he held for two years until the next election (which took place on May 25, 2010). Coulier is the successor to former Commissioner and fellow Full House cast member Bob Saget. In 2009, Coulier provided the voice for Bob McKenzie on the Canadian animated series Bob & Doug, based on the SCTV characters Bob and Doug McKenzie. Coulier became the first person other than Rick Moranis to portray the character, as Moranis (who serves as executive producer) was not interested in resuming the part. Coulier says he understands that longtime fans might be skeptical of his take on the role, but he could not help jumping at the chance to portray one of his favorite comic characters. "It's huge shoes to fill, stepping into Rick Moranis' shoes. It's such an established, great character and I guess the only thing I have going for me is that it kind of sounds alike and that half of my family is from Canada." His mother's family is from Bathurst, New Brunswick. Coulier continued to make regular television appearances as the host of shows such as America's Funniest People and America's Most Talented Kid. He continues to tour the U.S. and Canada as a stand-up comedian. Coulier currently reprises his role as Joey Gladstone for the Full House spin-off Fuller House. Coulier's stand-up routine is centered on his ability to mimic celebrities and cartoon characters, a talent that has given him a second career in voice acting. Many of Coulier's bits involve putting well-known characters into unexpected situations. Coulier has also been known to include harmonica playing in his act. Coulier's material is largely family-friendly, a position he has extended to his youth-oriented comedy website, cleanguys.TV. 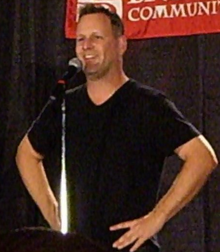 In April 2008, Coulier was featured on the Clean Guys of Comedy Tour, a family-friendly comedy group. The tour includes Ryan Hamilton from Last Comic Standing and Kivi Rogers. In the early 1990s, Coulier was married for two years to Jayne Modean. They have one son, named Luc Coulier, born in 1990. Having divorced, he started dating Alanis Morissette, but they broke up shortly before she recorded her album Jagged Little Pill. He is widely believed to be the subject of Morissette's song "You Oughta Know." In 2005, Coulier began dating photographer and producer Melissa Bring. They married on July 2, 2014, in Montana. Coulier is a private pilot who owns and flies a B35 Bonanza. His first general aviation flight was at the age of five in Michigan. He earned his pilot's license at the same airport later in 1979 and is now instrument rated. In 2012, he did more flight training in a Cirrus SR20 to "keep current". He is part of the Hat in the Ring Society to support the AOPA foundation, an organization that promotes safe flying. Coulier is an ice hockey fan and participates in charity events with the Detroit Red Wings. He is also an avid fan of the Detroit Tigers and has played in a few celebrity softball games alongside Tigers fan Tom Selleck. 1989 It's Garry Shandling's Show Garry's Voice Box Episode: "Garry Acts Like a Moron"
1995 Lois & Clark: The New Adventures of Superman The Real Anonymous Episode: "Chip Off the Old Clark"
1995 Freakazoid! Teenage Boy (voice) Episode: "Freak a Panel/Tomb of Invisibo"
1996 Pinky and the Brain Tom Hanks (voice) Episode: "Brain's Song"
1997 Extreme Ghostbusters Peter Venkman (voice) Episode: "Back in the Saddle: Part 1 & 2"
2002 The Zeta Project Delivery Bot (voice) Episode: "Resume Mission"
2002 Dexter's Laboratory Coach (voice) Episode: "Oh, Brother/Another Dad Cartoon/Bar Exam"
2003 Teen Titans Tramm / Captain (voice) Episode: "Deep Six"
2013 How I Met Your Mother Himself Episode: "P.S. I Love You"
2015 Grandfathered Therapy Patient Episode: "My Amal"
^ a b "Dave Coulier". TVGuide.com. Retrieved June 11, 2014. ^ Britt, Ryan (July 15, 2016). "The New 'Ghostbusters' Can't Ruin Your Deranged Childhood". Retrieved 28 February 2019. ^ Prudom, Laura (October 26, 2016). "The Muppets are returning to TV, but they'll look a little different". Mashable. Retrieved 28 February 2019. ^ Anderson, Cheryl (October 7, 2009). "Coulier on ABC's Full House". pqasb.pqarchiver.com. Archived from the original on July 24, 2012. Retrieved December 2, 2010. ^ Friedlander, Whitney (May 7, 2015). "'Full House' Reboot: Dave Coulier Joins 'Fuller House' on Netflix". Variety. Retrieved August 15, 2015. ^ Chiu, Melody (July 10, 2014). "Inside Dave Coulier and Melissa Bring's Montana Wedding". People. ^ Billups, Andrea; Nahas, Aili (June 11, 2014). "Full House's Dave Coulier Is Engaged to Melissa Bring". People. Retrieved July 2, 2014. ^ Blumm, K.C. ; Dyball, Rennie (July 2, 2014). "Dave Coulier of Full House Is Married!". People. Retrieved July 2, 2014. ^ "AOPA Summit - 10 Questions for Dave Coulier". ^ "Uncle Joey is a pilot". Aircraft Owners and Pilots Association. Retrieved March 22, 2012. ^ "Q&A: Detroit celebrity and Red Wings' fan, Dave Coulier '77 (NDHS)" (PDF). Archived from the original (PDF) on March 14, 2012. Retrieved March 26, 2014.